When the iPad was finally revealed in 2010, it took time for the market to know how to categorize the device; everyone settled on simply creating a new category. One year on, the lead that Apple has is a replay of its iPod-iPhone momentum, but Google’s Android caught up quickly. This year will be a truly fascinating one of winners and losers. Not interested? You should be. Media tablets have re-written the rules. iPad. You can do everything you want on one really. If you’re a high-end originator of Photoshop masterpieces or an individual with particularly fat fingers, you might not be so convinced, but if you try one for a reasonable period of time you’ll start to get frustrated with the boot-up time of your old laptop, the lack of software apps to enhance your entertainment or productivity and the whole battery-cable-charger-airport-connectivity thing. Give the human race 20 years and the laptops we all lug around will seem as ancient as the clay tablets the Assyrians used to record cuneiform lists of goats, gold and slaves. We’re witnessing the next evolution of computing and something on par with the mouse and graphical user interface computing milestones of the 1970s. Tablets are more in tune with the way we all consume and interact with data. Are you a reviewer or an originator? If you think about how you shuffle emails and comments up and down the food chain from the comfort of your queue at Starbucks, you’ll recognize that we have become much more accepting of the cloud and computing convenience. Remember when people used to print out and file emails for their records? According to the International Data Corporation (IDC) Worldwide Quarterly Media Tablet and eReader Tracker, vendors shipped 4.8 million units globally in the third quarter of 2010, compared to 3.3 million units in the second quarter. Apple’s iPad represented nearly 90 percent of the media tablets shipped worldwide in 3Q10. “The media tablet market’s rapid evolution will continue to accelerate … with new product and service introductions, channel expansion, price competition and experimentation with new use cases among consumers and enterprises,” said IDC’s Susan Kevorkian, research director, mobile connected devices. So what about your eReader Kindle: Does it factor in to this multi-million-user revolution? Well, no. According to IDC, media tablets are tablet-form-factor devices with color displays larger than five inches and smaller than 14 inches running lightweight operating systems (such as Apple’s iOS and Google’s Android OS) and based on either x86 or ARM processors. By contrast, tablet PCs (think full Windows) run full PC operating systems and are based on x86 processors. Media tablets support multiple connectivity technologies and a broad range of applications, which differentiates them from single purpose-focused devices such as eReaders. That’s where your Kindle comes in (if you still have one). So, keeping a focus on the media tablet market, the train has well and truly left the station and there are many vendors looking to stoke up to catch the next train. Google’s Android operating system for smartphones when deployed on a tablet was a pretty desperate grab at the handrail of the last carriage on the Apple express. Samsung’s initial Galaxy Tab was pulled from U.K. market after a high level of returns, while Toshiba’s Folio device was withdrawn completely. Neither offering was as intuitive and popular as Apple’s iOS. Google’s new Android operating system for tablets, codenamed Honeycomb, is the next wave of development. Motorola is expected to release a media tablet running on Honeycomb called the Xoom, while Research in Motion (RIM) will start marketing is its BlackBerry PlayBook slate. Hewlett-Packard will concentrate its efforts on a device that runs its own WebOS operating system. Good luck with that one, HP. Apple has more than 350,000 apps for the iPhone, iPad and iPod touch, while 60,000 apps are specifically designed for the iPad. Android has approximately 130,000 apps, most of them having been designed for smartphones, great for Android’s Nokia-killing handset manufacturers, not so good for media tablets. Google will have to encourage developers to create apps for the new Honeycomb OS, as will RIM. RIM announced that it plans to introduce in-app purchases, which is smart; this gives developers the ability to up-sell enhancements and smaller upgrades between major version releases, which helps to sustain churn revenues. “It will be a smaller ecosystem of players led by Android and Apple in the near term,”Allen Nogee, mobile analyst at In-Stat, commented recently in the Financial Times. RIM’s Blackberry is currently the U.K.’s most popular smartphone for business users, so they know what they’re doing. An interesting development of these market shifts is the channel. Apple sells direct and has direct relationships with customers via its online and high-street stores. Other players will have to navigate the support and manage the challenges of working with third parties – resellers, retailers and developers. Yet again, Apple appears to have got it right. It has never cracked the corporate market, however, although with its ownership of its own chipset, hardware, software, OS and digital content, this could be the company’s chance to really take its share of the corporate marketplace from the old guard of laptop manufacturers such as Lenovo, Toshiba and HP. Looking forward, IDC forecasts 44.6 million media tablets will ship in 2011, with the U.S. representing nearly 40 percent of the total. In 2012, IDC forecasts worldwide shipments of 70.8 million units. Growth in 2011 and beyond will be driven by device vendors introducing media tablets based on Android and other operating systems, as well as price and feature competition and strong demand in both the consumer and commercial segments. For the e-reader market, IDC anticipates 2010 to close at 10.8 million units shipped worldwide, with the U.S. representing 72.4 percent of global shipments. 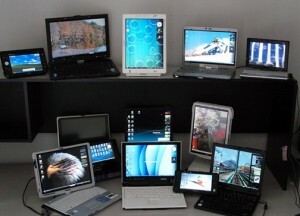 IDC forecasts 14.7 million units to ship in 2011 and 16.6 million in 2012. What does this mean for us all? It means that computing has changed in the space of a year – the desktop, the laptop and the smartphone have become integrated. This is a great time to build new applications and revenue. It’s also time for corporations to start planning IT strategies around mobile devices for the whole shooting match – security, AV, application version control, licensing, HR, surf control, proprietary app conversion and so forth. The market will change before our eyes this year and next. Ignoring these developments is not a great idea. This is the first contribution by Phil Newman, a London-based marketing and commercialization strategist for technology companies.